We all know our bodies change as they age: our muscles and joints begin to move less fluidly; our skin elasticity declines; we lose (or grow!) hair where we hadn’t expected. When we age, our bodies also become less able to absorb vitamins and minerals from the foods we eat. This can create deficiencies in important nutrients like iron and vitamin B12, which may affect our health adversely. But are vitamin and mineral deficiencies a concern only for elderly and aging populations? Until recently, scientists believed that vitamin deficiencies were a concern primarily for the elderly. However, new research from Tufts University suggests that vitamin deficiencies are far more common than previously believed. In this study, scientists evaluated the vitamin B12 blood plasma levels across a broad age sample (26-83) and determined that more than 25% of the individuals tested had less of the nutrient than medical guidelines recommend for optimal health. As the study also indicates, and what is perhaps even more surprising, is that it doesn’t take a significant deficiency before an individual feels the impact: side effects like declined cognition, depression, and lethargy can occur even fro individuals whose vitamin B12 levels fall in the low normal range. What is Vitamin B12, and why should I care? Vitamin B12, or cobalamin, is a water-soluble nutrient that travels through the bloodstream and helps the body regulate red blood cell production, ensures optimal nervous system functioning, and fuels cellular metabolism. Low levels of vitamin B12 can result in fatigue, memory problems, anemia, and in cases of serious deficiency, permanent nerve and brain damage. Vitamin B12 is known as an ‘extrinsic factor:’ a substance our bodies cannot produce and must be obtained from outside sources.Most people consume vitamin B12 entirely through the foods they eat.Sources include animal-based food products like meat, poultry, fish, dairy products, and eggs. Vegan-friendly vitamin B12 containing foods include fortified cereals and plant-based milks, and some types of nutritional yeast. Because they contain little to no vitamin B12 containing animal-based foods, those with vegetarian and vegan diets carry an elevated risk of vitamin B12 deficiency in comparison to others. However, research indicates that most people, irrespective of dietary preferences, do not consume the recommended daily amounts of this key vitamin. Given the importance of vitamin B12 for healthy body function, supplementation can be an excellent way to increase your intake of it beyond food sources. Which type of Vitamin B12 supplement is best for me? Oral vitamin B12 supplements in the form of tablets, capsules, and liquid drops have become a popular way to add more of the nutrient to one’s body: they are widely available, easy to administer, and can be found in vegan-friendly formulations. A quick look around your local co-op or natural foods store will reveal innumerable options of both combined and individual supplements, but are these products best for your body? Just like the nutrients we derive from the foods we eat, our bodies are only able to utilize the vitamin supplements through the digestive process. This can be especially concerning for adults over age fifty, when a person’s digestive enzymes become weaker and less able to break down and utilize nutrients in general. And because so many different vitamin B12 formulations exist on the market today, the absorption rate across supplements can vary considerably. 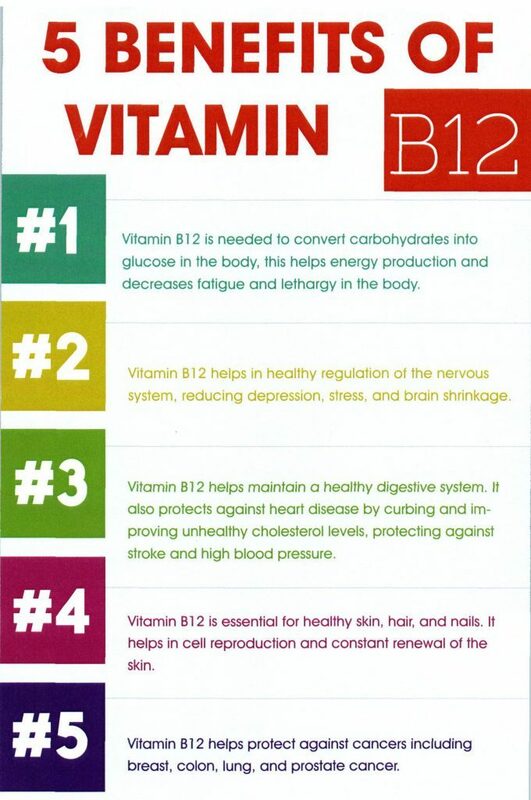 What can we do, given our limited capacity to utilize the full amounts of the vitamin B12 supplements we take orally? It’s simple: bypass digestion! In contrast to oral supplements, sub dermal or intramuscular vitamin B12 injections are more effective because the nutrient is immediately absorbed into your body rather than processed through digestion. B12 shots are among the most bioavailable methods, which makes them the best form of administration particularly for patients with leaky gut syndrome, IBS, Chron’s, intestinal dysbiosis, pernicious anemia, celiac disease, or who are taking some forms of anti-acid medication. What should I expect and how much does it cost? Prior to the B12 injection, an intradermal allergy test is performed with 0.1 – 0.2 ml of B12. The physician asks the patient for any itching sensation and inspects the area for redness or swelling. Allergic reactions are very rare. After the allergy test, 1 ml of B12 is given via a small fine syringe in an acupuncture point known to boost energy and metabolism. Most common points are LI 10 and Sp 10. This way, there is a synergistic effect between the stimulation of the acupuncture point and the injection of B12 into the body. The injection can be subdermal or intramuscular depending on desired effect. Subdermal is absorbed slower over a few hours whereas inttramuscular is more rapidly available. Frequency of B12 shots is based on patient’s needs and ranges from once a week to once a month. Cost of B12 injection is $30 if given by itself or $20 additional cost if combined with acupuncture treatment.